St George's Hall is widely regarded as one of the finest neo-classical buildings in the world and is a Grade I listed building. The idea for the Hall came about in the early 1800s from Liverpool people who were concerned about the lack of a place for the triennial music festivals, and shares were sold to raise funds. A venue was also being sought for the Civil and Crown Courts and it was decided that one building would serve both needs. The foundation stone of the Hall was laid in 1838 to commemorate the coronation of Queen Victoria, but the actual building of the hall did not start until 1842. It opened for public use in 1854, a truly multipurpose community building where people could be tried for murder, attend a ball or listen to a concert - all under one roof. St George's Hall fell into disrepair in the 1980s but was reopened in April 2007 following a £23m award-winning refurbishment project, and is now a focal point for cultural, community, civic, corporate and performing arts activities. From official ceremonies such as Remembrance Sunday to spontaneous gatherings to celebrate the success of the city’s football teams, the Hall has always been at the heart of community life in the city. 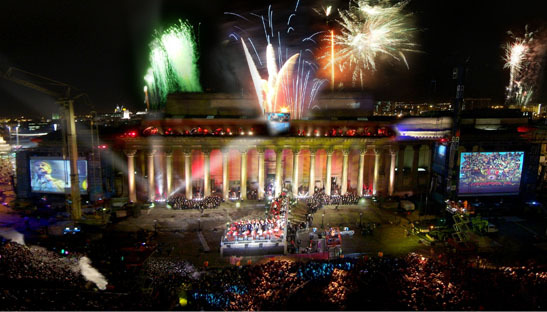 Over 25,000 people gathered outside the Hall when John Lennon was killed and in excess of 65,000 witnessed the spectacular Capital of Culture People’s Opening in 2008 which was hosted by the Hall.